On March 30, 2017 the Thai-Swedish Chamber of Commerce (TSCC) held it’s Annual General Meeting (AGM) 2017 at Sheraton Grand Sukhumvit, Bangkok. It was an eventful evening, starting with the formal AGM session but followed by a delightful dinner sponsored by SAAB and Husqvarna, during which the main attraction of the evening Mr. Korn Chatikavanij, former Minister of Finance, gave a speech about Thailands future. The formal AGM session gathered an unusual amount of participants, which of course added to the atmosphere. A lot of proxies ensured the votes of absent members. The final before dinner was the election of the board and the New president of TSCC Mr. Eric Hallin. Even more participants arrived after the AGM to take part of the dinner and speech. 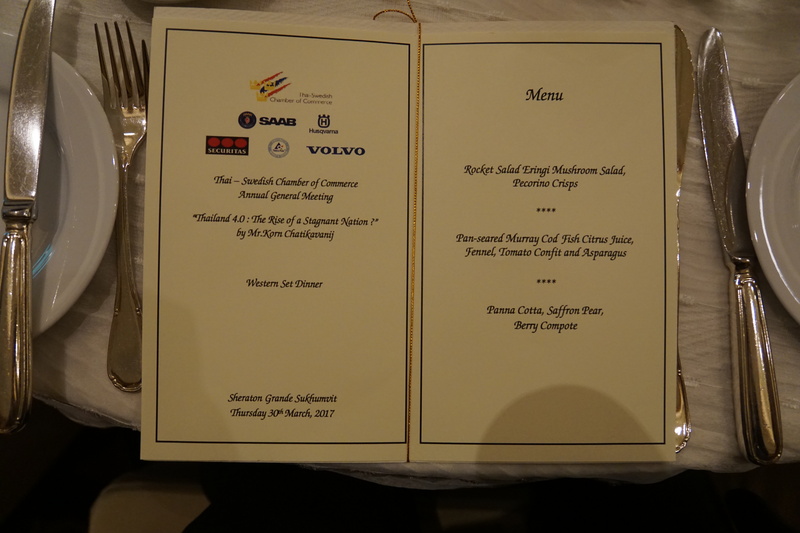 SAAB and Husqvarna generously sponsored the three-course dinner and a member in TSCC supplied free wine for all of us. There were plenty of opportunities for mingling and make contacts before the AGM, during dinner and afterwards. Here is Mr. Sonny Berg from BKK Condos talking with Mr. Håkan Wallenius from Wallenius Media and the magazine Thailandsposten. During the dinner Mr. Korn Chatikavanij gave an insightful and inspirational speech about the economic future for Thailand, “Thailand 4.0: The Rise of a Stagnant Nation?”. He gave us a wide perspective of the challenges and opportunities for Thailand. Below are a couple of the slides, but the full set can be viewed here. Mr. Korn Chatikavanij knows what he talks about and it shines through. He speaks easily and with little or no guidance from the slides. His background explains parts of his strong competence. He represents the Democrat Party of Thailand and he was the Minister of Finance 2008-2011 ( 2551-2554) and currently he is the party’s Chairman of Policy Unit. During his speech he mentioned Thailands role in ASEAN, a topic of certain interest for me so after the speech we exchanged our contact informations. Later Mr. Korn Chatikavanij came to set up a meeting between me and two of his colleagues, but that’s a topic for another post. The Swedish Ambassador H.E. Mr. Staffan Herrström attended both the AGM and the dinner together with Ms. Charlotta Schlyter, Minister Counselor at the Swedish Embassy, who is representing the embassy as observer at the TSCC. H.E. Mr. Staffan Herrström held an engaged closure speech after the dinner. Between the AGM session and the gala dinner H.E. Mr. Staffan Herrström briefed me about the connections between Sweden and the AIT, as promised in earlier emails on the topic between us. After the dinner and speeches I stayed for quite a while, having pleasant conversations with other participants. When I later returned home it was after several reunions but also with a number of new contacts to come back to. A really rewarding night!